However feeble the excuse that may be given for saying 'no', a gentleman always accepts it. If a woman says, "I can't invite you in, the place is too untidy,' he does not say, "Oh I love untidiness,' because he ought to know damn well what she means. A gentleman doesn't pounce ... he glides. If a woman sits on a piece of furniture which permits your sitting beside her, you are free to regard this as an invitation, though not an unequivocal one. If she sits in a chair, you are not really free to sit on the arm; the words, 'Surely you would be more comfortable over there,' mean "go away,' although whether they mean go away for ever or only go away for the time being you will have to work out later. The Pounce is desperate; The Glide is calm. The Pounce is clumsy with frustration; The Glide is airborne with sangfroid. Remember, "No" means "No." Now get out there and brush up on your sangfroid. Spot on! what a witty way to educate men. 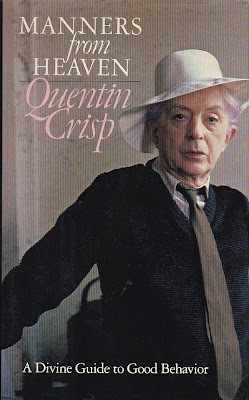 But I have always loved Quentin Crisp's cavalier attitude to housework. He said there wasn't much point in doing it because after 4 years the dust doesn't get any thicker. Why didn't I discover your blog before? It's absolutely wonderful. Oh I love Crisp!! I still have yet to read this book, it's been on my list forever (coincidentally i was viewing it on my amazon.com wishlist today!). I think it's a sign -it's next!